In mid 1985 members of a World Peacemaker group in Portland began to pursue the vision of a new congregation that would emphasize an uncompromising commitment to radical Christian discipleship, including active devotion to God’s kin-dom of justice and peace. Their vision was inspired in part by the example of the Church of the Savior in Washington, DC, with its emphasis on connecting the inward journey (faith and prayer) with the outward journey (witness and action in the world). John Schwiebert, a member of the group, who was then serving as pastor of Lincoln Street United Methodist Church, discussed with the current United Methodist Bishop Calvin McConnell his desire to devote full time to pastoral ministry in the new congregation. After the prospective members agreed that the new congregation would be a congregation of the United Methodist denomination, the bishop agreed to appoint John as its first pastor effective in June of 1986. The Bishop also agreed that the new congregation should have some freedom to develop a pattern of life different from that of a typical United Methodist Church, and that it would generate its own financial support without the usual start-up subsidy from the parent denomination. In the spring of 1986, while the discussions about the formation of the new congregation were in process John and Pat Schwiebert, Bruce and Ann Huntwork and several other participants in the developing congregation arranged to purchase the large house at NE 18th and Tillamook St. as the site for a Christian living community and for an ongoing ministry of hospitality, peacemaking and grief support. (See 18th Ave Peace House). One year later the purchasers deeded the house to the newly incorporated congregation and it has since been an important center in the life of the congregation. Sunday evening worship began in June of 1986, first at the 18th Ave Peace House, and shortly thereafter, because of space limitations, using the facilities of the Wilshire United Methodist Church. At the same time thirty adults (including parents of 20 children) enrolled in a weekly "School of Christian Living," designed to build community and prepare individuals for membership and leadership. Nineteen of the enrollees completed the 16-week course and, during Lent, 1987, became charter members of the congregation, which by then had come to be named Metanoia Peace Community. During later years the Metanoia congregation held Sunday worship in the facilities of Sunnyside-Centenary UMC and First African Methodist Episcopal Church before deciding to resume worshiping at the 18th Ave Peace House. Several major decisions mark the history of the congregation. In 1988, the congregation declared itself a "Sanctuary Church," joining with several other congregations in the Portland Sanctuary Coalition to provide shelter and protection of undocumented refugees fleeing from political persecution in Central America. In 1990, the congregation took under its corporate umbrella, a program called "Perinatal Loss" started by Pat Schwiebert under the sponsorship of the Oregon Health Sciences University Foundation. As a part of Metanoia the program has since expanded its range of ministries to bereaved persons under the new name Grief Watch. Also, in 1990, the members voted unanimously to become a "Reconciling Congregation," joining a growing list of United Methodist churches that openly welcome and include gay men, lesbians, bi-sexual and trans-gender persons in their life and ministry. In 1993 the congregation took the further step of hiring the Rev Joyce McManus, a lesbian, as co-pastor, in opposition to the official policy of the United Methodist Church forbidding "self-avowed, practicing homosexuals" from serving as pastors. 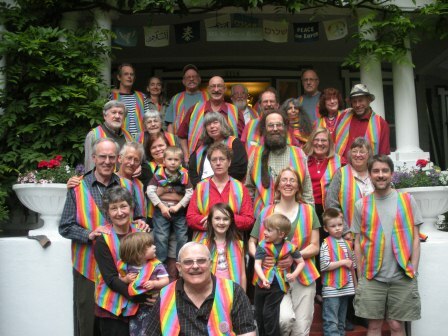 In 1994, in order to provide housing for Joyce and her family and to facilitate the creation of a second living community, members formed the Metanoia Housing Cooperative and pooled their financial resources to purchase the "Tillamook House" at NE 17th Ave and Tillamook St.
By 1995, however, it became clear that the congregation did not have sufficient financial resources to continue the support of a second pastor, and after a contentious debate covering several months, a majority (80%) of the members voted to discontinue the co-pastor position. The conflict, however, took its toll and a number of persons, out of loyalty to Joyce, and believing that the church should have found a way to keep her in the church’s paid employ, withdrew from the congregation. A further difficulty at that time was that Joyce, her partner, and one other person who left the church were still members of the Metanoia Housing Cooperative and were residents and part owners of the Tillamook House. Problems related to the ownership of the house weren’t resolved until two years later when the church and other members of the cooperative bought out the interests of the residents. Subsequent attempts to form another permanent living community in the Tillamook House were unsuccessful. Then, for a time, the Tillamook House became the temporary home for a family of refugees from Kosovo, whose residency in the United States was sponsored by the Metanoia community. After they moved into permanent accommodations, the house was sold. In 2000, the congregation voted to become an active, dues-paying institutional member of the Metropolitan Alliance for Common Good, a broad based organization of area churches, synagogues, labor unions, community development corporations and other community-based groups. The Alliance is a vehicle through which people are building power for social change, sufficient to match the power of major corporations and their government sector allies. John Schwiebert continued to serve as the pastor appointed by the United Methodist bishop, even though he was officially granted retirement status by the denomination 2001 and no longer received salary or other financial support from the congregation. However in 2011 John announced his intention to retire from preaching and leadership in the congregation effective July 1, 2012. With 15 months to prepare, the members of the congregation began to assume more of the responsibilities of worship, administration and pastoral leadership, They also decided not to ask that a new pastor not be assigned. instead they decided to seek affiliation with another congregation and continue to conduct Sunday evening worship as a "Metanoia Fellowship" under the umbrella of that other congregation. When the plan did not come to fruition, the remaining members decided to disband and give each other permission to seek membership in other congregations or to start new house churches. The last congregational worship gathering was held on December 30, 2012. Today the other components of Metanoia Peace Community remain. The 18th Ave Peace House living community is still going strong and exercising its ongoing ministry of community, peacemaking and hospitality. Grief Watch has become a separate non-profit corporation and continues to publish books and manufacture other resources to help people who are grieving personal loss.